The back cover touts this novel as “Sherlock Holmes meets The Dying Earth“, and it’s not far wrong: The protagonist, Henghis Hapthorn, the foremost “discriminator” of his time, is an ultra-rationalist detective in the Holmes mode (right down to the brusque attitude), and he lives in an era in which an age of science is coming to an end, to be replaced by an age of magic. The book diverges from its high concept there, however: This age is merely the latest to be ruled by science, and the pendulum has swung many times in the past (our own era has been lost to antiquity), and science still rules the day, although thaumaturges are popping up here and there, heralding the coming change. Moreover, Hapthorn himself has had several encounters with forerunners of the new age, and his most recent one turned his integrator (basically, his personal digital assistant) into a mammalian familiar, and also brought his intuitive side out into its own fully-realized personality which now shares Hapthorn’s mind. Although he tries to, Hapthorn doesn’t suffer this upsetting of his status quo with a lot of dignity. That’s just the background for the book, which starts with Hapthorn being hired to investigate the new boyfriend of the daughter of an Old Earth noble, before coming back to be asked to look into a situation which could threaten the Archonate, the ruler of all of Old Earth. Hapthorn’s investigation explores some tangible clues involving a string of murders, as well as delving into murky details of the history of Old Earth. Hughes often seems to be evoking other stories or styles – Asimov or Piper style imperial space opera, Douglas Adams’ Dirk Gently – but the novel stands on its own without feeling like a mash-up, and I assume the evocative moments are deliberate. Ultimately the story revolves around Hapthorn and his other self learning to live with each other, Hapthorn with the knowledge that the new age will cause him to fade away, while his sharer is not yet fully formed, yet they’re two sides of the same coin, a fact neither of them fully embraces. Hapthorn himself is especially resistant, since he requires evidence and logic and is unable to take his sharer’s intuitive leaps on faith or trust. This impedance drives the story’s climax, which was a little disappointing since it seemed to undercut Hapthorn as the hero. Although it had a nifty denouement and final line. 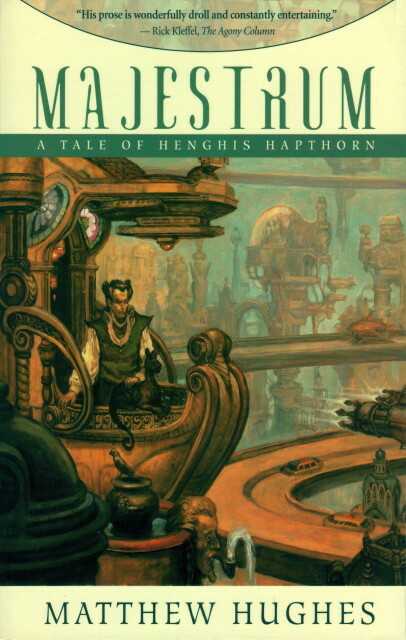 With some fine world building, intellectual sleuthing, and a witty narrative, Majestrum is a neatly constructed book which could appeal to a wide variety of SF readers. It takes a little while to get into, but the ride was well worth some persistence.